photo-eye | BLOG: Book Review: Girl Plays with Snake. Book Review: Girl Plays with Snake. Book Review Girl Plays with Snake. By Clare Strand Reviewed by Adam Bell Consider the snake—hold it, drape it over your shoulder, or simply run, look away, and close your eyes. Snakes, like many misunderstood and maligned creatures, tend to provoke strong reactions. By Clare Strand. Mack, 2016. Mack, London, England, 2016. 128 pp., color and black-and-white illustrations. Consider the snake—hold it, drape it over your shoulder, or simply run, look away, and close your eyes. Snakes, like many misunderstood and maligned creatures, tend to provoke strong reactions. I Love Snake. I Hate Snake. The refrain echoes across the front and back of Clare Strand’s new book, Girl Plays With Snake, and highlights the ambivalence and humor central to the work. On the one hand, Strand’s book fits nicely within a growing category of art books that compile, rearrange and recontextualize found photographic imagery. But, like the titular snakes, looks are deceiving. For a project that began with fear and aversion (in this case Strand’s own towards the reptile), it is also playful and humorous, hinting at the obviously culturally loaded imagery of women and snakes but ultimately pointing to the unstable meanings of all imagery. Peppered throughout the book are textual fragments, written by algorithmic poetry bots, that push meaning to absurd places, forcing us to return to the images, look closely, taking them apart, playing with them until they sliver away inert—beautiful, strange and funny. Girl Plays with Snake By Clare Strand. Mack, 2016. It seems appropriate that the book opens with its most ferocious image—a snake, mouth open, poised to strike. I Hate Snake. From there it moves on and the snakes are coiled, draped and docile, at peace with their handlers. I Love Snake. Drawn from tabloid press photos and other vernacular sources, the appropriated photos show happy women holding snakes—smiling they address the camera calmly. Hold the snakes close or gingerly handle them with poles. Despite the tortured and ambivalent refrain of the cover, these women seem to enjoy themselves as they embrace the snakes. Strand dislikes snakes, but was obviously compelled enough to gather all these images, collecting them over years. In interviews, she admits that the work first began when her daughter informed her that she had held a snake in school. Disgusted and intrigued, Strand initially drew on her own archive of imagery, but then began actively seeking out images of women and snakes. As an artist, Strand has long utilized archival or appropriated imagery in smart but playfully humane works and this is no exception. 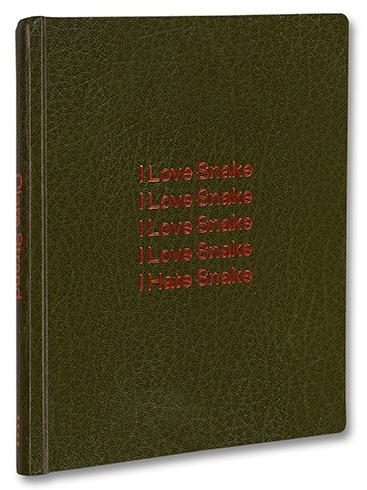 Bound in a faux-snake leather cover, the book fits comfortable in the hands—its size suitably intimate. Combining dramatic full-bleed images with full-size reproductions, the book moves in and out of the images—drawing us close and then pulling away. Love. Hate. In the close-ups, we see the grainy lines of a transmitted press photo, but also get the beautifully mottled skin of the snake and manicured nails. Thick outlines of a retoucher’s paintbrush silhouette the arms and snake, drawing our eyes to the curves and lines of entwined hand, body and serpent. Throughout the book are half-page fragments of disjointed verses that play off the title of the book, Girl Plays With Snake. Fed into poetry bots and tweaked by Strand, the title gave birth to nonsensical verses that defy easy interpretation. Like the snake itself, their unstable meaning wriggles out of our grasp.